Area: 308,252 sq. km., population: 52,178,844 (1956); 66,180,000 (ca. 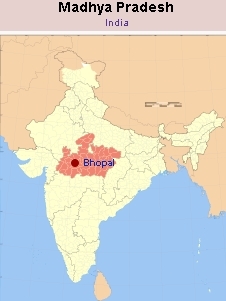 1991); capital: Bhopal; Principal language: Hindi. The economy of Madhya Pradesh is primarily agricultural with nearly 80 percent of the population living in villages. Over 42.5 percent of the land is arable and 14 percent is irrigated. Forests cover nearly 32 percent of the state. The state is divided into 50 districts. There are seven major river systems. Before 2000 Mennonite churches are scattered in the five southeastern districts, viz., Rajandgaon, Durg, Raipur, Bilaspur, and Surguja. However, on 1 November 2000 the 16 Chhattisgarhi-speaking southeastern districts, including the five previously mentioned, formed the state of Chhattisgarh. See also India; Mennonite Church in India; Bharatiya General Conference Mennonite Kalisiya. India 1985, compiled and edited by Research and Reference Division, Ministry of Information and Broadcasting, Government of India. New Delhi: Allied Printers, 1986: 579-581. Juhnke, James C. A People of Mission: A History of General Conference Mennonite Overseas Missions. Newton, KS: Faith and Life, 1979: 17-43 passim. Malagar, Pyarelal J. 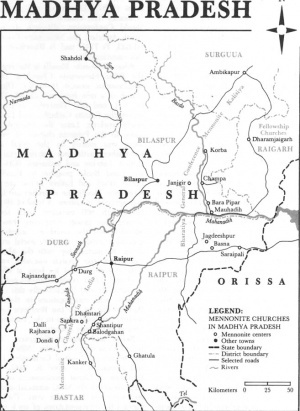 "Madhya Pradesh State (India)." Global Anabaptist Mennonite Encyclopedia Online. 1987. Web. 18 Apr 2019. http://gameo.org/index.php?title=Madhya_Pradesh_State_(India)&oldid=92519. Malagar, Pyarelal J. (1987). Madhya Pradesh State (India). Global Anabaptist Mennonite Encyclopedia Online. Retrieved 18 April 2019, from http://gameo.org/index.php?title=Madhya_Pradesh_State_(India)&oldid=92519.